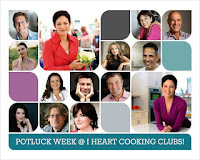 "January Potluck", the theme at I Heart Cooking Clubs (IHCC). For this week, we get to cook with any of IHCC's past and present featured chefs. I've made Ellie Krieger's simple salad using toasted pita and fresh herbs. I love this simple salad. The salad dressing is a mixture of lemon juice, lemon zest, olive oil and seasoned with salt and pepper. The scallions and fresh mint are from my garden pot, along with the fresh cucumber which I've freshly harvested that morning. What I like about this salad is the combination of the fresh herbs with the lemony dressing, very refreshing. The crisp leafy greens and the crunch of the toasted pitas with my addition of hard-boiled eggs makes this a satisfying plate for a light lunch. Split the pita into 2 rounds and toast on a baking sheet on the middle rack of the oven until golden brown, about 10 minutes. Allow the pita to cool and break into bite-size pieces. Set aside. In a small bowl, whisk together the lemon juice, lemon zest, salt and pepper. Add the oil and whisk to incorporate. Toss the lettuce, parsley, scallion, mint, cucumber and tomatoes together in a large serving bowl. Right before serving, add the pita and dressing to the salad. Toss well to coat and serve. It's Tuesdays With Dorie (TWD) week. We have two selected recipes to bake from each month and for this month, we were given the choice to select which recipe to bake first. I've made Fluted Carrot-Tangerine Cake two weeks ago, and for this week, it is Lemon Squares, French Style. I love lemon bars, one of my favourite baked lemony treats. Dorie's French style lemon squares comes in three layers. The bottom layer is a buttery shortbread dough, using the same dough, some is reserved as a streusel topping, with some chopped almonds sprinkled over. Sandwiched in between these two layers is the delicious lemony curd. I made the lemon curd the day before and bake the lemon squares on the next day. Made half the recipe and some changes to the amount of butter and sugar. There's quite an amount of butter for the curd itself! For half a recipe, it calls for 1 stick plus 1 tablespoon butter, which is about 130gm. I used only 60gm and it works out just fine for me. As for the sugar, I've used a scant 1/2 cup of sugar, with slightly less than 1/3 cup of lemon juice. The lemon curd cooks up pretty quick and it is lemony, silky, and very, very yummy! Love it! Lemon curd, so silky smooth and very addictive! The shortbread dough is easy to make. But the amount of sugar in the recipe is a little too much for me. I like salty buttery crust, instead of sweet crust. Since the lemon curd is lemony sweet, I've reduced the amount of sugar for the dough to 50gm (original amount for half a recipe is 125gm). Some of you may be wondering about the texture of the dough with the amount of sugar I've reduced, but it works for me, and I have always reduced the sugar for Dorie's sweet pastry dough recipe each time I make it. And the dough has always turns out buttery, tender and flaky without being overly sweet. For half a recipe, I've baked the lemon squares in a 7" square baking pan. Some chopped almonds is sprinkled over the streusel topping and bake until the edges are caramelized and the curd is puffy, about 45 minutes. Remove from oven and allow to cool completely in pan over a rack. Dorie says to allow at least 2 hours and up to 6 hours before cutting. I've left mine to cool overnight and cut it the next morning. These bars are really yummy with the perfect amount of sweetness. The dough is buttery, salty, flaky just as I like. The struesel topping with the bits of almonds is a different take on the usual lemon bars that I've made before. Much as I like these bars with the streusel topping, my personal preference is still the old-fashioned way with just the shortbread base and the lemon curd without any topping, with just a sprinkling of powdered sugar over the squares. But that being said, these bars are really yummy, I would say no if served a piece of these! A yummy lemony treat, good to snack on anytime. "You Have It Made", the theme for this week at I Heart Cooking Clubs (IHCC). 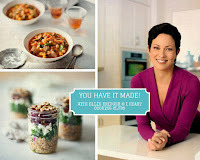 You Have It Made is Ellie Krieger's latest cookbook recently released in January 2016. This latest book is all about making meals ahead of time, which can be refrigerated or freeze to be reheated and serve when needed. 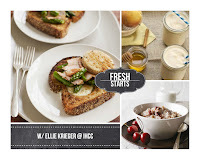 This week's theme is to make any make ahead meals from Ellie Krieger's recipes. Now, since I do not have Ellie's latest cookbook (it's on my wishlist!! ), I turned to her other books which I already have and found this delightful muffins. According to the recipe, these muffins can be refrigerated for 3 days, or wrap individually and freeze for up to 3 months. Why are these called Better Blueberry Muffins? Because it uses applesauce and a small amount of canola oil instead of butter. The sugar is very much less than other muffin recipes. And it has yoghurt and milk, both low fat. But both my yoghurt and milk that I used are full-cream! oops....!! On top of that, there's whole meal flour with an equal amount of plain flour. Like most muffin recipes, these are pretty easy and quick to make. Mix the dry ingredients in a bowl. Mix the wet ingredients in another bowl. Add the dry ingredients to the wet ingredients, stir to combine, do not overmix. Add the blueberries and stir to combine. Then scoop onto the prepared muffin pans and bake until golden. These muffins are soft, moist and not too sweet. Perfect for breakfast, tea-time or just something to snack on when you are feeling a little hungry. I freeze a few by individually wrapping them in foil, and I thaw them completely before reheating them in a 375F oven for 12-15 minutes still wrapped for breakfast a few days later. They are just as soft and moist, very nice. Preheat the oven to 400F. Coat a 12-cup muffin pan with cooking spray. In a large bowl, beat together the sugar, oil, and eggs, until the mixture is light yellow and slightly frothy. Whisk in the applesauce, yoghurt, milk, vanilla and lemon zest. Stir the dry ingredients into the wet, mixing just enough to combine them. Do not overmix. Gently stir in the blueberries. Pour the batter into the prepared muffin pan. Tap the pan on the counter a few times to remove any air bubbles. Bake until a wooden toothpick inserted into the center of one of the muffins comes out clean, about 20 minutes. Allow to cool on a wire rack for 15 minutes. Run a knife around them to loosen and unmold. Enjoy warm or let cool completely before storing in an airtight container in the refrigerator for up to 3 days or wrap individually and freeze for up to 3 months. Kung Pao Chicken is a dish that is a favourite of many. It is one of the dishes that we would often order when we eat out at Chinese restaurants. There are many versions of Kung Pao Chicken. According to Grace Young, this version is one of her favourites. As with most stir-fry dishes, this is great as a main dish with rice. I have used cashew nuts instead of peanuts, as I have always prefer cashew nuts in Kung Pao Chicken. I have one green bell pepper instead of red, so I have used that instead. I have omitted the powdered Sichuan peppercorns, simply because I have forgotten to toast the whole Sichuan peppercorns and ground them into powder. Whole Sichuan peppercorn tastes quite pungent, so I have not included them in the dish. Note to self, to make some powdered Sichuan peppercorns, as there are some other recipes that uses this ingredient. There's an ingredient which I've completely forgotten to add into the dish, my half cup of chopped scallions! I've found my small bowl of chopped scallions hidden behind some bowls when I began to clear away the dishes after dinner! Nevertheless, this is a tasty dish! In a medium bowl combine the chicken, ginger, garlic, cornstarch, soy sauce, 1 teaspoon of the rice wine, 1 teaspoon of the sugar, 1/2 teaspoon of the salt, and 1 teaspoon cold water. Stir to combine. In a small bowl combine the broth, vinegar, dark soy sauce, sesame oil, and the remaining 1 tablespoon rice wine. Heat a 14-inch flat-bottomed wok or 12-inch skillet over high heat until a bead of water vaporizes within 1 to 2 seconds of contact. Swirl in 1 tablespoon of the peanut oil, add the chillies and ground Sichuan peppercorns, then, using a metal spatula, stir-fry 15 seconds or until the chillies just begin to smoke. Push the chilli mixture to the sides of the wok, carefully add the chicken, and spread it evenly in one layer in the wok. Cook undisturbed 1 minute, letting the chicken begin to sear. Then stir-fry 1 minute or until the chicken is lightly browned but not cooked through. Swirl the remaining 1 tablespoon peanut oil into the wok. Add the bell peppers and stir-fry 1 minute or until the peppers begin to soften. Swirl the broth mixture into the wok and stir-fry 1 minute or until the chicken is just cooked through. Add the peanuts and scallions, sprinkle on the remaining 1 teaspoon sugar and 1/4 teaspoon salt, and stir-fry 30 seconds or until the scallions are bright green. This week's Bake-Along #91 theme is Strawberry Shortcake. Selected by Zoe to bake together with Lena, myself and everyone is invited to bake-along with us. I have so many Strawberry Shortcake from my many baking cookbooks. There's recipes that uses sponge cakes and others that uses a buttery dough as the cake base, with the same filling, strawberries and whipped cream. After going through a few recipes, I've decided on this simple one, though the recipe from Flour Bakery Cookbook sounds good, with balsamic strawberries. I might just make that one of these days. The shortcake base is pretty easy to make, it is similar to making scones. I've made them into squares though the photo in the book is actually lovely rounds. I was lazy to use a round cookie cutter and by cutting them in squares, I do not have to re-roll the scraps. Yup, I can get pretty lazy at times! As for the strawberries, I've added 1 tablespoon of kirsch which gives a lovely fragrant aroma. The shortcakes are buttery and tender. Lovely when sandwiched with the filling of the fragrant boozy strawberries and the lightly sweetened whipped cream. I drizzled some lovely juice, (there's a lot of juice! ), from the macerated strawberries onto the plate, and the shortcakes soaks the juices up pretty quick. These Strawberry Shortcakes makes a lovely dessert treat. In a bowl, using an electric mixer fitted with the whisk attachment, whip the cream, sugar and vanilla on medium speed until medium peaks form. Use right away or cover with plastic wrap and refrigerate until ready to use, up to 4 hours. Whisk the cream briefly before using. To make the shortcakes, preheat the oven to 400F (200C). In a bowl, whisk together the flour, baking powder, salt, sugar and lemon zest until well blended. Using a pastry blender or 2 knives, cut in the butter until the pieces are about the size of peas. Add the cream and gently toss with a fork until the flour is just moistened and the ingredients are blended. Turn the dough out onto a lightly floured work surface. Gently press into a thick rectangle about 6 by 4 inches (15 x 10cm). Trim the edges even, then cut the dough into 6 equal squares. Place the shortcakes on an ungreased baking sheet, spacing them well apart. Brush each with a little cream, then sprinkle with sugar. Bake until puffed and golden, 15-18 minutes. Transfer to a wire rack to cool slightly. Meanwhile, in a bowl, toss together the strawberries and sugar with a fork, lightly crushing some of the berries. Let stand until ready to serve. Split the shortcakes in half horizontally and place the bottom halves, cut side up, on plates. Spoon some of the strawberries, including the juices, over each half and top with a dollop of whipped cream. Top with the remaining shortcake halves, cut side down, and serve. For our next Bake-Along, we will be baking Chocolate Chip Cookies, recipe from Bake In The Day Bakery Cookbook, pg 172, or here. Link your post to our linky which will open from 25th February to 5th March. Everyone is welcome to join us! Only current posts please. Cookbook Countdown #1, recipe no. 4, from my selected book for this month, Stir-Frying To The Sky's Edge by Grace Young. I've made "Stir-Fried Eggs with Velvet Shrimp". We love egg dishes, and especially so when there's shrimps, one of our favourites. Just as it's name, the shrimps are velvety smooth and crisp tender. The shrimps are marinated in egg white-cornstarch mixture, and according to Grace Young, this is what, which gives the shrimps a crisp silky texture. This is a delicious stir-fried egg dish. A very nice dish to serve at dinner time and could easily be a family favourite. I have made this again a few weeks later, and have substitute the peas with a large handful of coarsely chopped cilantro, and it was very fragrant and delicious. In a medium bowl combine the shrimp, the 1 teaspoon egg white, cornstarch, 1/2 teaspoon of the rice wine, and 1/8 teaspoon of the salt. Stir until the cornstarch has dissolved. Stir in 1 teaspoon of the oil. Put the shrimp uncovered in the refrigerator for 15 minutes. Bring the shrimp to room temperature for 15 minutes. In a medium bowl beat the eggs, pepper, and the remaining 2 teaspoons rice wine and 1/4 teaspoon salt. Heat a 14-inch flat-bottomed wok or 12-inch skillet over high heat until a bead of water vaporizes within 1 to 2 seconds of contact. Swirl in the remaining 2 tablespoons oil, add the scallions and ginger, then, using a metal spatula, stir-fry 10 seconds or until the aromatics are fragrant. Add the shrimp and stir-fry 1 minute or until the shrimp begins to turn colour but is not cooked through. Add the peas, swirl the egg mixture into the wok, and stir-fry 1 minute or until the shrimp is cooked through and the eggs are just set but still moist. Do not overcook. 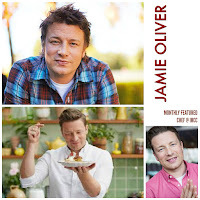 It's our monthly featured chef week at I Heart Cooking Clubs (IHCC), and the featured chef is Jamie Oliver. I have six of his books and out of the hundreds of recipes, there's one chicken dish that I've been wanting to make for a long time. Hit 'N' Run Traybaked Chicken. Such a funny and interesting name for a dish. I like its name and the dish even better! According to Jamie "Everyone needs a hit 'n' run recipe like this - it's the kind of fallback meal you can enjoy when prep time isn't on your side. It's simply a case of putting together a combination of ingredients that really love each other, then just tearing, mixing, marinating and baking. It's super quick to prepare, and you're letting the oven do all the work". Yup, this is a super easy meal to prepare. The chicken thighs are very moist and tender, baked to a lovely golden brown. I've used cherry tomatoes instead of large tomatoes, and have used an additional tablespoon of balsamic vinegar, adding it in when I was basting the chicken during cooking . I tasted the lovely juices during basting, and felt that it needed a little more balsamic vinegar, adjust to taste. This delicious chicken meal is served with some green salad on the side. Preheat the oven to 180C/350F/gas 4. Quarter the tomatoes and place them in a large baking dish or roasting tray (roughly 25cm x 30cm). Peel the onions and cut into large wedges, then deseed and roughly chop the peppers. Add all these to the tray along with the chicken thighs. Squash the unpeeled garlic cloves with the back of your knife and add to the tray, then pick over the thyme leaves and sprinkle over the paprika. Add the oil, balsamic and a good pinch of salt and pepper. Toss everything together really well to coat, then spread across the tray, making sure the chicken isn't covered by the vegetables. Roast for around 1 hour, or until the chicken is golden and cooked through, turning and basting it a couple of times during cooking with the juices from the tray. Serve the traybake with a lovely green salad on the side. You could also buddy it up with a little rice, polenta or a loaf of crusty bread to mop up the juices. Cookbook Countdown #1, recipe no. 3, from my selected book for this month, Stir-Frying To The Sky's Edge by Grace Young. I've cooked Yin Yang Beans, a delicious vegetable stir-fry dish, which is perfect as a part of a Chinese meal, served with rice alongside some other dishes. I did make some slight changes to the recipe. Pickled ginger is used but I did not have any, so I have replaced with a tablespoon of each, sweet and salty preserved radish, both of which I've bought already chopped to small pieces. Also, I have omitted the rice wine. Instead of partially cooked the beans by boiling it in salted water, I did the easy way, I microwaved the beans for 2 minutes on high with 2 tablespoons of water and a pinch of salt. And I've used more ground pork and red pepper flakes than indicated in the recipe. A very tasty dish, goes great with fluffly jasmine rice. One dish that I would be cooking again. In a 3-quart saucepan bring 1-1/2 quarts water and 1/2 teaspoon of the salt to a boil over high heat. Add the beans and cook 1 minute or until they are bright green and the water almost returns to a boil. Drain the beans in a colander, shaking well to remove all excess water. In a small bowl combine the soy sauce and rice wine. (I microwaved the beans for 2 minutes, with 2 tablespoons of water and a pinch of salt). Heat a 14-inch flat-bottomed wok or 12-inch skillet over high heat until a bead of water vaporizes within 1 to 2 seconds of contact. Swirl in the oil, add the garlic, fresh ginger, and red pepper flakes (and preserved radishes if using) and stir-fry 10 seconds (1-2 minutes) or until the aromatics are fragrant. Add the pork, and using a metal spatula, break up the pork, and stir-fry 30 seconds to 1 minute (3-4 minutes) or until the pork is no longer pink. Add the beans, pickled ginger, and scallions and sprinkle on the remaining 1/4 teaspoon salt. Swirl the soy sauce mixture into the wok and stir-fry 1 minute or until the pork is cooked through and the beans are crisp-tender. This week's bake at Tuesdays With Dorie (TWD) is Fluted Carrot-Tangerine Cake. It is an inch high, light and spongy carrot cake with the fragrance and flavours from ginger and citrus. I have used orange instead of tangerine. And the pie pan I used has straight sides instead of fluted. As usual, I have reduced the amount of sugar, using only a scant half cup, and it works for me. I can already taste the sweetness, and it tastes sweeter on the next day too. I cannot imagine how sweet it is with the full amount, a whole cup of it for a one-inch cake. There's grated carrots, orange zest and juice, and grated fresh ginger in the batter. It certainly smells lovely when the cake is baking in the oven! I thought that this cake is nice. Light, soft and moist with a fragrant citrusy taste. Goes well with a cup of warm tea. Please visit the other bakers at Tuesdays With Dorie (TWD). I've made a stir-fry noodle dish for our weekday lunch. Recipe is from Stir-Frying To The Sky's Edge by Grace Young, the book which I'm cooking with this month, for Cookbook Countdown, which I'm co-hosting with Emily of Emily's Cooking (Makan2) Foray. For more details on how to join Cookbook Countdown, please click here. Originally, recipe is called Beef Chow Fun, but I have used pork fillet instead of beef. A simple and tasty stir-fry broad rice noodles (which is locally called as kueh teow). This noodle dish uses fermented black beans, an ingredient which I have not used in a noodle dish before, and find that I like it. We enjoyed this Pork Chow Fun and would definitely be cooking this again. Makes a very nice meal, either for lunch or even a simple dinner. Cut the beef with the grain into 2-inch-wide strips. Cut each strip across the grain into 1/2-inch-thick slices. Put the beef in a shallow bowl and add the soy sauce, cornstarch, and sesame oil. Stir to combine. Leaving the noodles as a slab, cut it crosswise into 1/2-inch-wide strips. Using your hands, separate and loosen the strips to make about 4 cups. In a small bowl combine the oyster sauce and rice wine. Heat a 14-inch flat-bottomed wok over high heat until a bead of water vaporizes within 1 to 2 seconds of contact. Swirl in 1 tablespoon of the peanut oil, add the ginger and garlic, then, using a metal spatula, stir-fry 10 seconds or until the aromatics are fragrant. Push the aromatics to the sides of the wok, carefully add the beef and spread it evenly in one layer in the wok. Cook undisturbed 1 minute, letting the beef begin to sear. Add the fermented beans and stir-fry 30 seconds or until the beef is lightly browned but not cooked through. Transfer the beef to a plate. (Using pork, I stir-fry till the pork is fully cooked). Swirl the remaining 1 tablespoon peanut oil into the wok, add the noodles, and spread evenly in one layer in the wok. Cook undisturbed for 1 minute or until the noodles are slightly crusty. Add the bean sprouts and stir-fry 1 minute or until the sprouts are just limp. Return the beef with any juices that have accumulated to the wok, add the scallions, sprinkle on the pepper and oyster sauce mixture, and stir-fry 1 minute or until the beef is just cooked.